Every so often, incredibly energetic charged particles will reach Earth - and we're not sure what could possibly be powerful enough to generate these cosmic rays. Now we might have the answer...and it's just an absurdly specific set of circumstances. Pulsars have long been one of the favorite candidates to explain the source of these particles that can reach energies of 1019 electronvolts. Pulsars are a rotating, highly magnetized form of neutron star, which are the ultradense remnants of supernova explosions. We know that these a pulsar emits an extremely powerful beam of electromagnetic radiation - indeed, the way the beam rotates relative to Earth is what gives the pulsar its "pulse" - and physicists have targeted this as a possible source for the ultra-energetic cosmic rays. The problem is that pulsars can't just form anywhere - you're only going to find one in the middle of a massive debris field created by the preceding supernova explosion. That dense cloud of particles might provide too great an obstacle for cosmic rays to escape, at least not without losing a big chunk of their energy from collisions with other particles. Not that there's anything wrong with that, of course, but it does rather defeat the purpose of looking at them as potential sources for these supercharged particles. You could also wait for the supernova debris to spread out enough for more particles to stream through - but by then, the pulsar will have slowed its rotation enough that it likely won't be able to create these particular cosmic rays. It's a bit of a cosmic catch-22. But, as New Scientist reports, researchers at the University of Chicago have found that there's one slim window where these the pulsar is still rotating fast enough to emit these ultra-energetic particles and the supernova debris is just wide enough for them to escape. Their model suggests that newborn pulsars could meet these conditions...for the first year of the pulsar's life. After just one year, the pulsar is no longer rotating fast enough to create the particles we've observed. Of course, a year is barely a nanosecond in the lifetimes of stars, which might make this seem just too ridiculously finicky to be believed. But the researchers point out that this accounts for one big question regarding these cosmic rays, which is the shockingly high iron content in the ultra-energetic particles. Pulsars are thought to have lots of iron in their crust, and the heavier atomic weight of iron could actually help account for how it reaches such ridiculously high energies in the first place. Now all we need is a pulsar to form somewhere near us so that we can actually put this theory to the test. The good news is that, once that happens, we won't have very long at all to wait before we know if this idea holds up. arXiv via New Scientist. 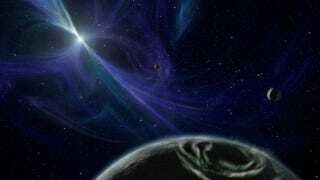 Artist's conception of pulsar solar system by NASA/JPL-Caltech.